For big conferences requiring multiple large rear projection screens to small business meetings needing a basic tripod screen, the professionals at Real Time are your best choice for corporate AV! 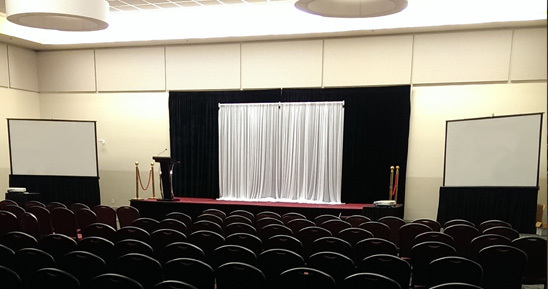 We have many screen / projector options to choose from & the right one for your event! 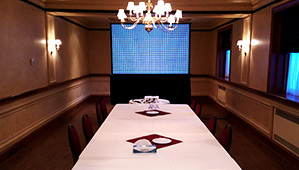 - If you want to be in control, we can setup the system for your presentation and leave it to you to run. - We also offer live video mixing between multiple sources such as cameras, prerecorded video and logos. If you need an on site camera operator or two for your event, we would be happy to provide that for you. We also have Elmo document cameras available for presentations of any size. We can run full HD 1080p video signal from any source over 300'. We use the correct tool for the job and always have spare projectors, screens & bulbs on hand in case of any surprises. We carry Epson Projectors & Draper Screens.